Preheat oven to 375°. Melt the butter in an 8x8-inch pan, about 10 minutes. Remove from oven, cool slightly. Roast pecans on a baking sheet for about 10 minutes. In a medium bowl, combine baking mix, milk, brown sugar and egg. Mix well. Pour into the baking dish. Carefully scoop out the peaches and distribute evenly over the batter. Pour the remaining peach syrup on top. Bake 35 minutes. Allow cobbler to cool completely. 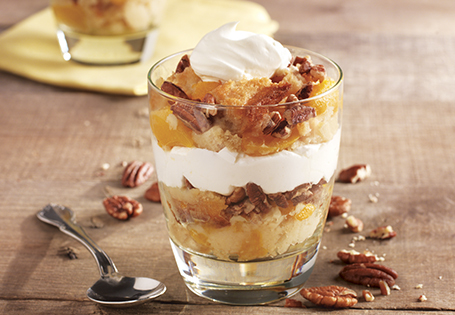 In a parfait glass, layer cobbler, pecans and whipped topping. Serve immediately.